I was reading the 2018 Stellar Roadmap, and I was trying to think outside the box on what types of tokens can be created on top of the Stellar network, to spur adoption and get people used to using cryptocurrencies. Drawing inspiration from the Reddit XLM tipbot, and even the tip-happy community of Dogecoin, I came upon the idea of "Time Saved Tokens". So that's why I created Time Saved Tokens. You can tip people with SECONDS, MINUTES, HOURS...heck, you could even send them some DAY tokens if a user helped you solved a problem that would've taken you half a week to solve! Money is money. Smart people can always make more money. But I feel that the satisfaction of knowing you saved someone a lot of time, a resource that none of us can ever get back, will make that person feel good about themselves, and want to continue helping the world. A poor teenager who wants to get ahead in this tough job market is suffering from the catch-22 of needing job experience to get a job, but to get a job, they need job experience or college education. He/she has a passion for helping solve other programmers' problems on StackOverflow or Reddit. A StackOverflow reputation score can help impress job recruiters, but since one of the key rules of a good resume is quantifying or qualifying your skills, I feel that people tipping Time Saved Tokens to the teenager can quantify just how helpful he or she is to other people. Additionally, the memo-notes section of Stellar transactions can be used by tippers to write out and elaborate upon the problem they were helped with. You're a user on an Internet forum, but it is starting to become infested with internet trolls who disrupt conversation. A setting can be programmed into the forum, such that only users who are helpful in the real world (TimeSavedToken.Hour.Amount > USER_SPECIFIED_AMOUNT) will be given the privilege of their posts to be seen, while users who fall under this criteria will have their posts hidden. Time Saved Tokens can be acquired for free at LabasanCryptoFountain.com. Enter your Stellar account's address into the input field, and follow the instructions to ensure that your account is able to receive non-XLM tokens. 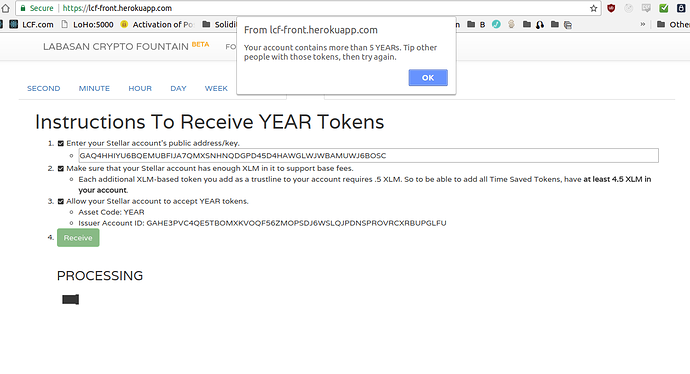 Finally, press the Receive button, and the site will send you whichever various Time Saved Token you have selected.